Savage Gulf State Natural Area is an incredible spot located in the Cumberland Plateau. From the air, Savage Gulf looks a lot like a giant crow's foot carved in to the plateau. Here you'll find numerous hiking trails, waterfalls, scenic overlooks, swimming holes, caves and even a natural Stone Door. There are multiple spots to take in the wonderful views of the gulf. The Stone Door Ranger Station offers a short, relatively easy trail to the Stone Door, 10 foot wide, 100 foot deep crack in the rock. 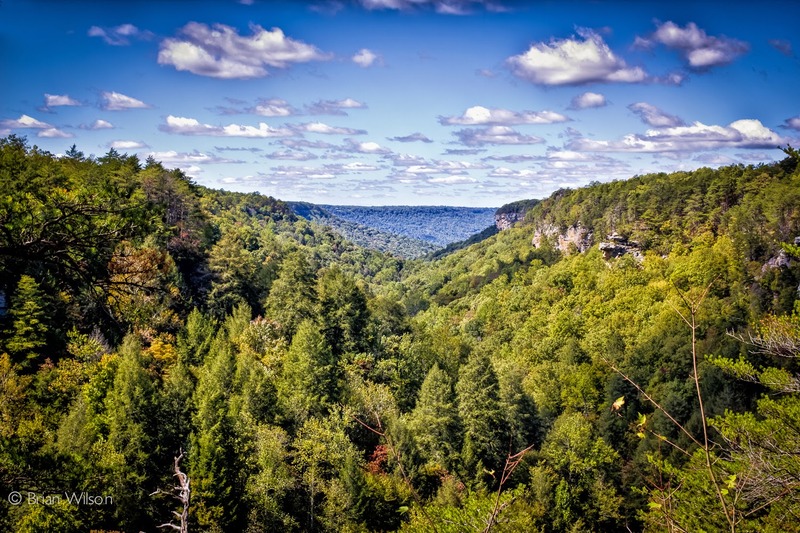 The Savage Gulf Ranger Station features the Savage Gulf Day Loop Trail, a 4.2 mile loop trail that offers views (and a short access trail) of Savage Falls and a wonderful view of the gulf itself (featured in the photo above) from Rattlesnake Point Overlook. And there are many hikes that take you down in to the gorge. Collins Gulf, for example, features the very popular Horsepound Falls on its journey down. You can find long day hikes and there are a number of spots to camp out to make a full weekend of exploration.